What are Markov Chains and Markov Models? The most basic type of Markov model is a Markov chain, a model whose next state is only selected based on its current state. Markov chains are used in genetics, finance, economics, game theory, and other fields. An example of one would be predicting tomorrow's weather by looking only at today's weather, not yesterday's. In probability theory, a Markov model is a stochastic model used to model randomly changing systems where it is assumed that future states depend only on the current state, not on the events that occurred before it (that is, it assumes the Markov property). The transition from one state to another satisfies the Markov Property. It states that the probability of transitioning to any other state is only based on the current state, and not on the sequence of states that came before it--thus every Markov process is memoryless. The situation: You are a climatologist in the year 2799, studying the history of global warming. You can't find any records of Baltimore weather, but you do find my (Jason Eisner's) diary, in which I assiduously recorded how much ice cream I ate each day. What can you figure out from this about the weather that summer? I recently thought, "what would be the Twilio way of explaining this concept?" Since developers are DOers let's show, not tell, an example. 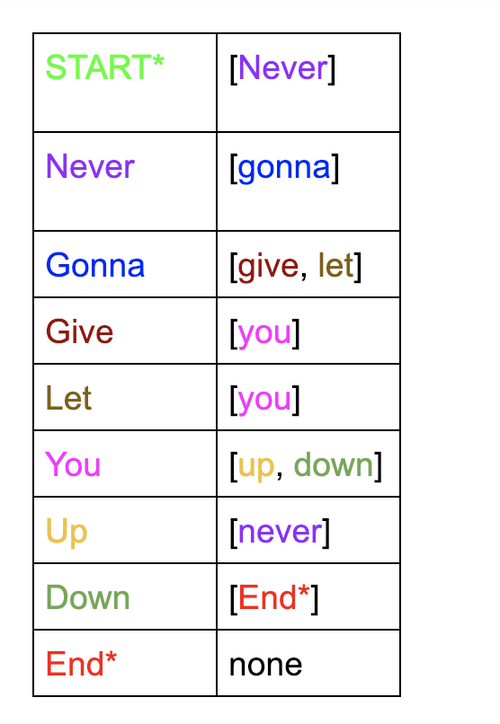 Let's break down a sentence that means something to Twilio: Never gonna give you up. Never gonna let you down. This has ten words (also known as tokens) and seven unique words (also known as keys.) A weighted distribution is the percentage that one key will appear. It is based on the total amount of times a key shows up divided by the total number of tokens. "Never", "gonna", and "you" all have a weighted distribution of 2/10, as shown in the histogram below. Histograms are a simple way to represent weighted distributions. These keys, or words, can also represent states. Each key can point to another key: this is called a transition. Let's visualize how every key is matched with an array of possible tokens that could follow that key. Here, the tokens are organized in pairs with a state corresponding to the possible states that can follow it. How can this better be visualized? Let's try adding the weighted distributions so that each arrow has the probability that it will be selected as the transition to the next state. Swift Playgrounds are amazing at letting you see the results of your code quickly. We'll be using them in addition to a Swift library called MarkovModel to visualize our Markov model example via code. Now make sure you open up your .xcworkspace and not .xcproject and place the following starter code in your .playground file to check that the pod installed correctly. 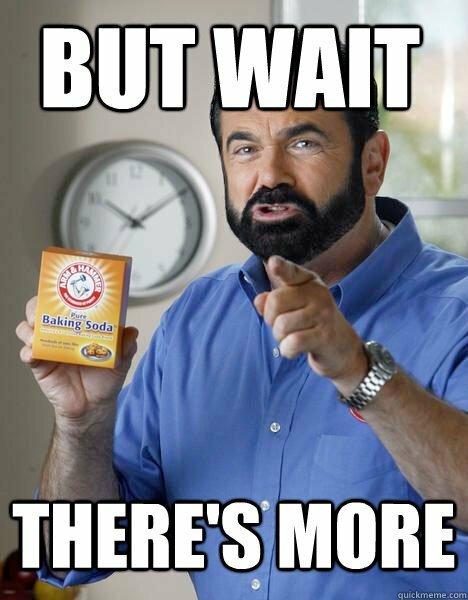 You may need to clean with cmd-shift-k and then build with cmd-b, but should be good to go! 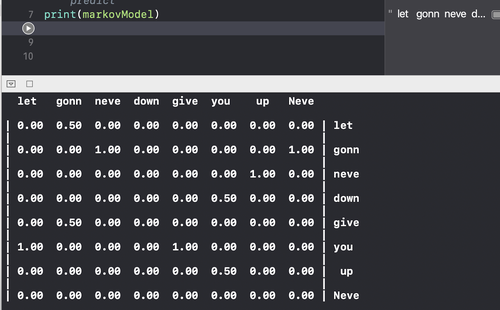 Let's translate our rickrolling sentence into Swift code using methods from the MarkovModel library. 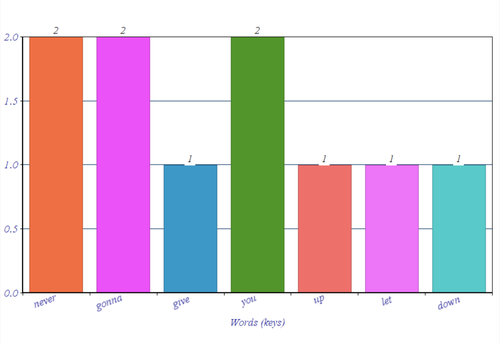 Here, we create a Markov model to train and pass it an array of the tokens from our sentence. We calculate a future state by calling next. With this library we have three possible decision process options: predict, random and weightedRandom. The default is predict. Wow! Markov chains are so powerful. As a Golden State Warriors fan, I wonder about trying to predict the outcome of their games based on prior games, or maybe how Steph Curry will shoot based on previous statistics. Think of the other possibilities--they're endless! For more resources to learn about Markov chains and models, I recommend this Clemson University lecture or UC Davis one, and this interactive explanation of Markov Chains and Khan Academy video. Stay tuned for the next post where we will train a Markov model with different inputs to generate similar text. In the meantime, let me know how you would use Markov models in the comments, on Twitter or GitHub or via email at lsiegle@twilio.com!